Victim Advocate Hotline: +1 (910)322-3418. National Domestic Violence Hotline: +1 (800)799-7233. The blue "Email Us" button is for non-emergency communication. Submissions to the blue "Email Us" button above are monitored Monday through Friday between 8 a.m. and 5 p.m. 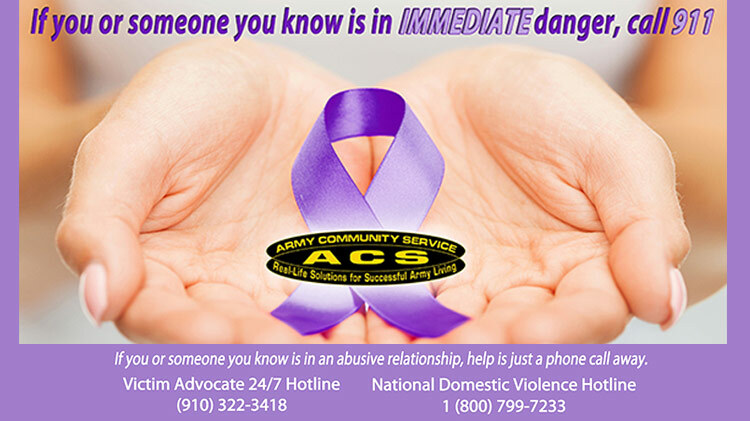 If in need of immediate or emergency assistance due to a domestic violence situation, please call 911 or the Fort Bragg Victim Advocate 24/7 Hotline at +1 (910)322-3418. Take the Relationship Quiz (.pdf) to find out more about your relationship. Partner abuse is defined as a pattern of behavior resulting in emotional/psychological abuse, economic control, and/or interference with personal liberty. In other words spouse or partner abuse can include something as obvious as a slap or a hit, but also includes less noticeable controlling, threatening or emotionally abusive behaviors. No one needs to stay in a relationship where they are being physically or emotionally abused by their partner or spouse. Visit the National Coalition Against Domestic Violence to learn more. What help is out there for a victim? 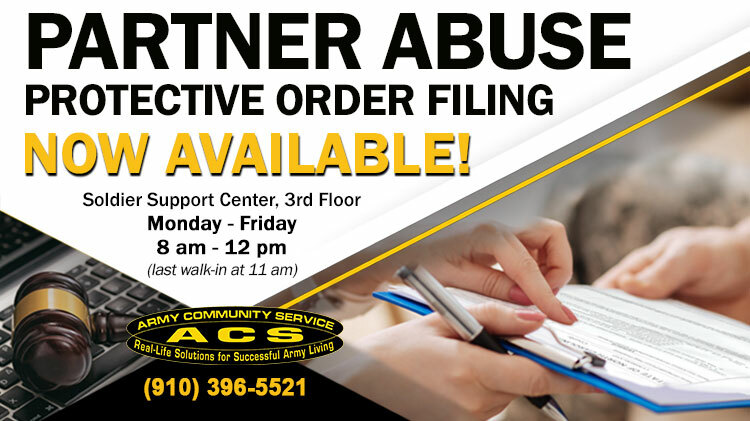 Victim Advocates are available for any Soldier, Family member, or retiree who is in an abusive relationship and needs help. Victim Advocates will help you make an immediate and on-going safety plan, provide victims with information about their rights and reporting options, link victims to Military and Civilian resources, and provide support and advocacy to include accompaniment to medical appointments, court proceedings, and interviews with attorneys, police, and/or command. You can speak with a Victim Advocate by calling or visiting our office during regularly scheduled hours. There is also a Victim Advocate available 24/7. Family Support is available if a Soldier/Offender is Discharged/Separated from the Army or Jailed Because of Abuse: A program called Transitional Compensation will provide an offender’s family with monthly payments, medical benefits and access to the PX and Commissary for three years. This benefit is in place for victims who might stay with an abusive spouse out of fear of losing money, healthcare, and housing. Contact a Victim Advocate to ask about this program - there are selection criteria to meet in order to be eligible. Learn more about Transitional Compensation (.pdf). These are just a few of the centers that offer private, supportive information on how to heal the relationship or how to safely leave it, depending on the victim’s desire. In many cases, the caller may be told that they can give their name, come in for help, and still receive private information, medical care and other support without having to initiate a Family Advocacy assessment, tell command or make a police report. Get more information on what military help (.pdf) is available. Many foreign-born victims may have been threatened by their spouse that they will be deported or lose citizenship if they tell about the abuse. The Multicultural Readiness Program can help foreign-born spouses find help and supportive friends. Visit the Multicultural Readiness Program for more information on this program. What about my privacy? Do I have a choice? Yes! All incidents of domestic violence should be reported, however there are two options to get help: restricted or unrestricted reporting. Restricted reporting allows the victim, on a confidential basis, to disclose the abuse only to certain individuals (Victim Advocate, Healthcare Provider, or Military Chaplain) to receive medical care, counseling, and supportive services. This option can only be given when there is not a threat of serious or possible harm to the victim. Neither law enforcement nor command will be contacted. To make a restricted report: contact a Victim Advocate or call the 24-hour hotline at the top of this page. Unrestricted reporting allows the victim to receive medical care, counseling, and supportive services, and the abuse is reported to Law Enforcement and the Soldier’s command. An investigation is completed to ensure the safety and well-being of the victim and other Family members who may be at risk of harm. In cases where there is an obvious danger of imminent threat of harm or the presence of child abuse, a Victim Advocate or Healthcare Provider may be required notify others to ensure the safety of all persons involved in the abusive situation. Anyone needing information or help for situations involving partner or spouse abuse, but is worried about their case being reported to command or Law Enforcement or about protecting their privacy, should still call someone. Victims can ensure their privacy by not giving their name until they feel completely informed about the options they have for getting help. Contact us Monday-Friday 8 a.m.-5 p.m. or call the 24-hour hotline at the top of this page any time to find out more about victim privacy. I want to leave this relationship, but how do I do it safely? Sometimes deciding to leave an abusive relationship is an extremely difficult decision and can be a time when you are more at risk of additional abuse and violence from the abuser. Victim Advocates will assist you with developing a safety plan (.pdf), filing a protective order, and connecting you to a local shelter, if needed. For more information about how to safely leave a relationship, please feel free to contact us. Remember, you do not have to do this alone! Call a Victim Advocate for support. We have support available 24/7. I’m not a victim, but I suspect that my friend is. What can I do? The National Domestic Violence Hotline can give great tips and information on how to help a friend. Please consider referring a friend to professional help by asking them to contact the Fort Bragg 24-hour Victim Hotline listed at the top of this page or go to Family Member Behavioral Health at +1 (910)907-7869. Do not attempt to take care of things yourself. Domestic Violence can be a very complex and potentially dangerous issue. How to help a friend or neighbor that you suspect is being abused (.pdf). Many spouse would like to find help for their abusive partner and many abusive partners may welcome this support. There are many counseling options and support groups within the community. Personnel at any of the listed numbers listed above can provide information about help that is available. If a partner is being physically abusive marriage or couples counseling is often not a good option, but there are many other helpful options for assistance. What is the Commander’s role? Commanders and other leaders are required to report Family violence, to seek help for all parties involved and to help ensure safety to the fullest extent possible. Commanders and the military or local police can provide a great deal of effective help, including documenting the abuse, arresting the offender, helping with securing a military or Civilian no-contact/protective order to ensure the victim is safe, helping to find legal assistance and ordering an offender/Soldier to treatment. Although commanders and leaders are concerned about the safety of Families in their units, they cannot ensure their safety unless they know about the abuse. They also understand that many victims will never come forward unless they have an option that will keep their situation completely private (restricted reporting). Children in Family violence situations usually know something is not right, even if they have not directly witnessed a Family violence incident. Many offenders have learned their abusive behaviors from having grown up in an abusive home of their own. Children may display different reactions and coping skills, depending on their age. Younger children may blame themselves for the chaos around them which can create feelings of guilt, worry, and anxiety within the child already suffering unrest. Children may become withdrawn, non-verbal, and exhibit regressed behaviors such as clinging and whining. Eating and sleeping difficulty, concentration problems, generalized anxiety, and physical complaints (e.g., headaches) may also occur. If you would like more information, please contact any of the listed numbers on this page. Army Emergency Relief (AER): This program can help with emergency financial assistance.